Hoe in Hand by Edwin M. Gardner, 1903. Edwin M. Gardner, illustrator, portraitist, and cartographer, was born near Pulaski in Giles County, but while still a young boy, he moved with his family to Mississippi, where he probably had some formal training in art. While in his teens, Gardner fought in the Civil War as a member of Nathan Bedford Forrest’s cavalry. Following the war, he began his formal art education in Memphis, then moved to Europe to train at the Royal Academy in Brussels, with later studies in France and Italy. Upon his return to the United States, Gardner resumed study at the National Academy of Design in New York. 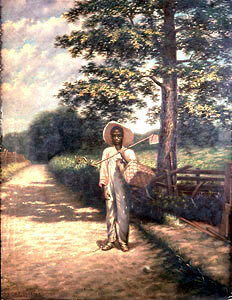 Afterwards, he moved to Aberdeen, Mississippi, where he taught art at a female academy. He next moved to Winchester in Franklin County, where he spent five years on the faculty at Mary Sharp College. Gardner made his last home in Nashville, where he had his greatest artistic influence. He made the first woodcuts and pen portraits for photoengraving used in the local daily newspapers, including the first published pen portrait of Sarah Childress Polk. Although Gardner was listed in the catalogue of the 1885 Watkins Institute art show as a teacher there, he actually taught under the auspices of the Nashville Art Association in the art room which Watkins provided. His first official association with Watkins’s Night School probably came in September 1910, when he was hired to teach industrial art. (School commissioners were perhaps still uncomfortable with the term “fine” art.) Gardner’s presence on the Watkins Institute faculty gave the school a teacher trained in commercial and fine arts. He encouraged his students to draw by taking casts and using live models, and this laid the foundation for the school’s Department of Fine Art.